Alibaba Cloud has formed a strategic partnership with SAP China, with the goal to jointly deliver enterprise-class cloud computing services to companies in mainland China. The partnership initially plans to focus on integrating the resources of Alibaba Cloud and SAP on the Alibaba Cloud platform. Businesses are expected to benefit from a one-stop-shop cloud computing environment. 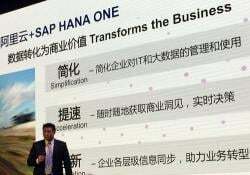 Going by the partnership, SAP China will provide software-as-a-service (SaaS) offerings and SAP HANA One enterprise clatabase solutions. In turn, Alibaba Cloud will offer busness applications that are available on Alibaba Cloud. The delivery of these applications will be supported by Alibaba Cloud's cloud infrastructure. With the joint offerings, customers of Alibaba Cloud and SAP China are expected to benefit from using SAP applications and Alibaba Cloud's cloud computing resources. "Cloud computing has become the basis of a new economy based on data, driving technological innovations that push the traditional boundaries of business farther than ever before and creating greater value for all stakeholders," Simon Hu Xiaoming, president of Alibaba Cloud said. "Together, Alibaba Cloud and SAP will seek to build a unified ecosystem that makes cloud computing more accessible to businesses and organizations everywhere and converts computing power into commercial benefit," he added. According to Edward Chen Wei (pictured above), chief business officer of SAP Greater China, SAP currently operates a US$600 billion worth of business network, provides over 30 products in its cloud portfolio, and serves 44 million cloud users worldwide. "With the capabilities of human capital management, SAP HANA platform, customer engagement and commerce, business networks and Internet of things, SAP is able to provide end-to-end digital business solutions," Chen said.